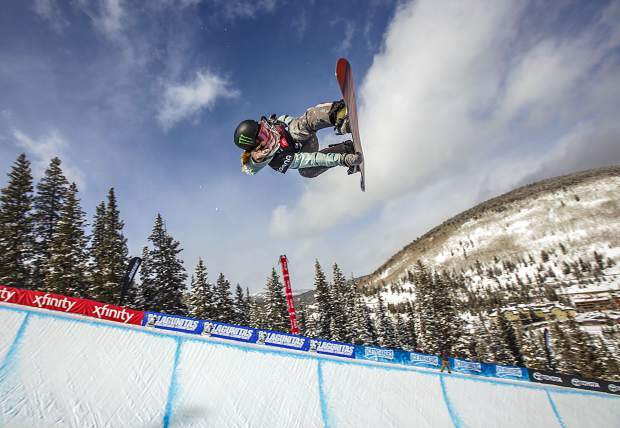 Ikko Anai, of Japan, lands in his last run of the Toyota U.S. Grand Prix World Cup halfpipe snowboard men's finals Saturday, Dec. 8, at Copper Mountain. 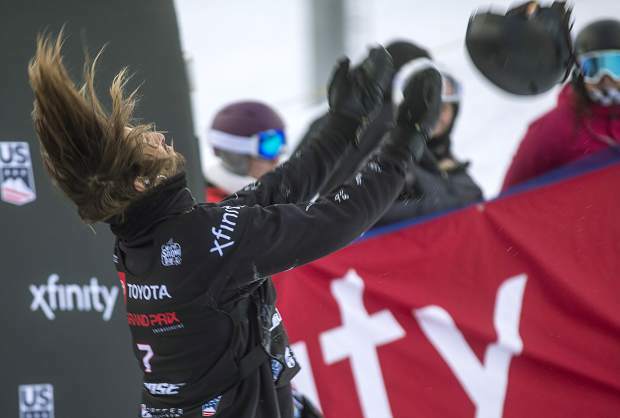 Patrick Burgener, of Switzerland, tosses his helmet in the air following his last run of the Toyota U.S. Grand Prix World Cup halfpipe snowboard men's finals Saturday, Dec. 8, at Copper Mountain. Burgener placed 4th. 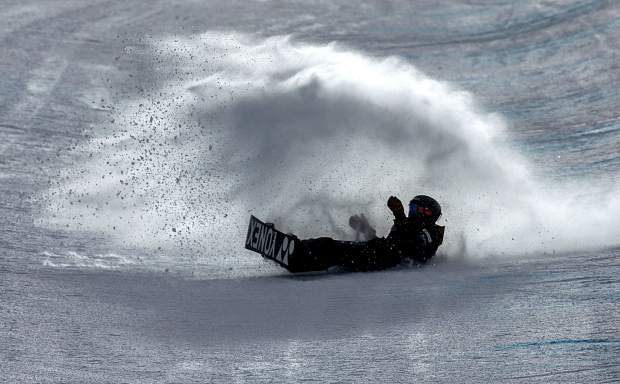 Yuto Totsuka, of Japan, crash lands during the Toyota U.S. Grand Prix World Cup halfpipe snowboard men's finals Saturday, Dec. 8, at Copper Mountain. 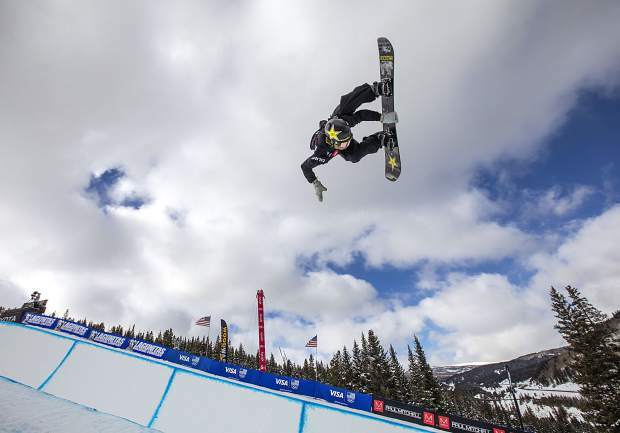 Birk Irving, of Winter Park, takes a fall in the halfpipe finals of Toyota U.S. Grand Prix World Cup event Friday, Dec. 7, at Copper Mountain. 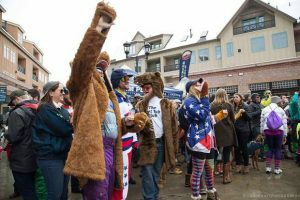 A fan in front without a cellphone reacts with others of Raibu Katayama's crash landing during the Toyota U.S. Grand Prix World Cup halfpipe snowboard men's finals Saturday, Dec. 8, at Copper Mountain. 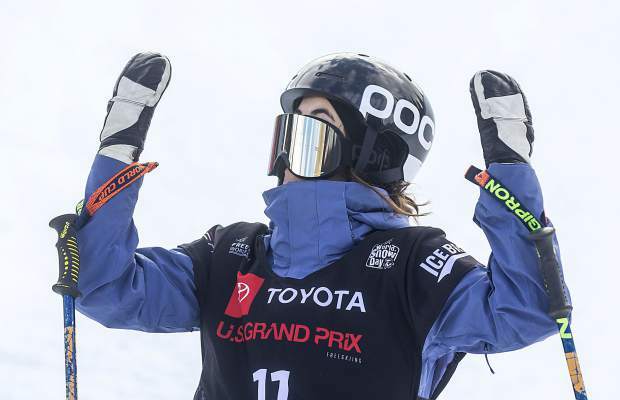 Rachael Karker, of Canada, displays her misplaced googles following her last run in the Toyota U.S. Grand Prix halfpipe freeskier women's finals Friday, Dec. 7, in Copper Mountain. Karker placed 4th. 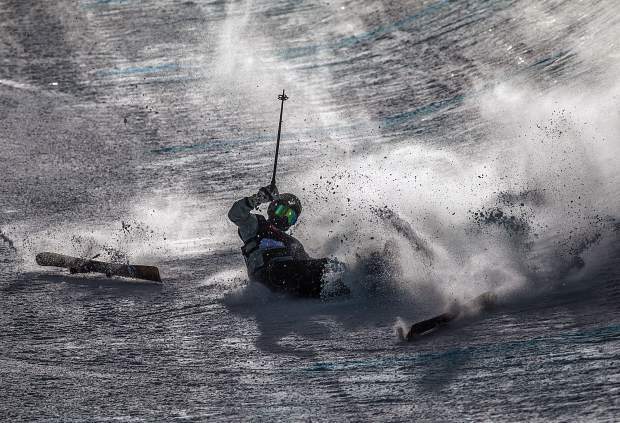 Grounds crew member scrapes lumps of snow off at the bottom of the halfpipe Friday, Dec. 7, at Copper Mountain. 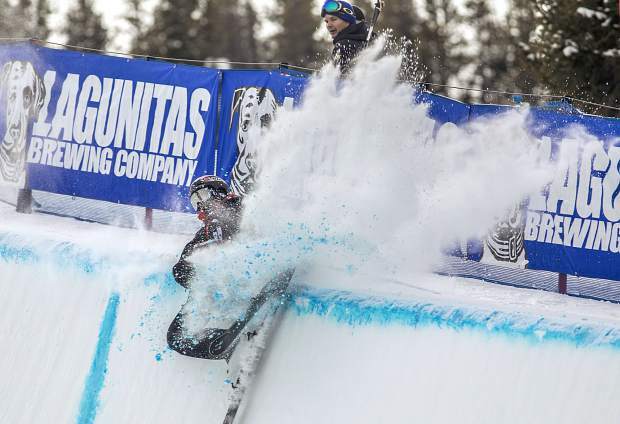 Eagle resident Jake Pates executes a trick during the Toyota U.S. Grand Prix qualifiers Thursday, Dec. 6, at Copper Mountain. 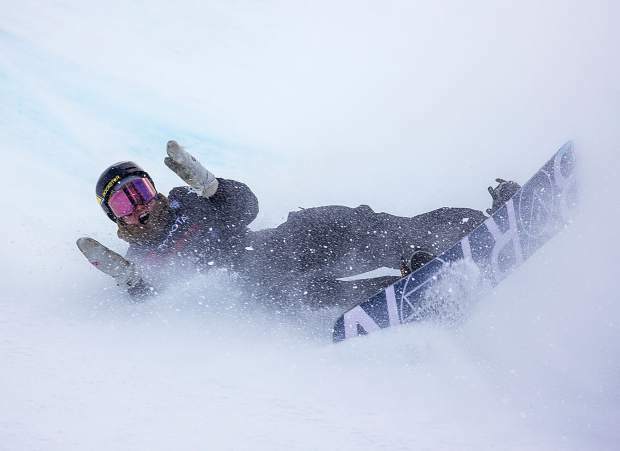 Patrick Burgener, of Switzerland, reacts following his last run of the Toyota U.S. Grand Prix World Cup halfpipe snowboard men's finals Saturday, Dec. 8, at Copper Mountain. Burgener placed 4th. 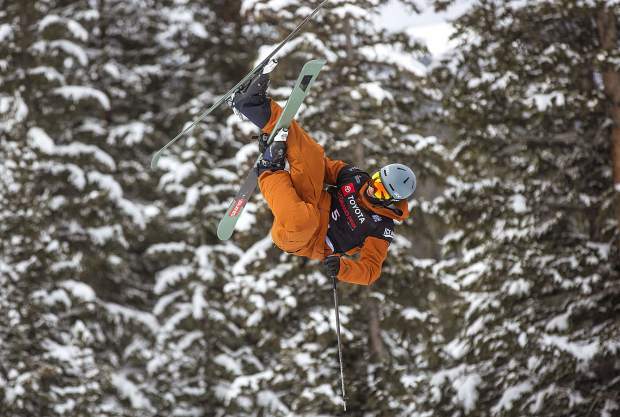 Thomas Krief, of France, in midair among fine trees during the qualifiers Wednesday, Dec. 5, at Copper Mountain. 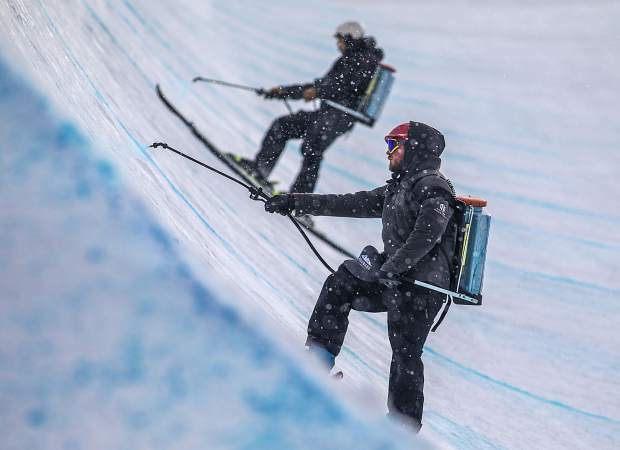 Copper Mountain employee Mike Daigle dyes the halfpipe increase visibility for the snowboard competitors in the Toyota U.S. Grand Prix event Thursday, Dec. 6, at the resort's Center Village. 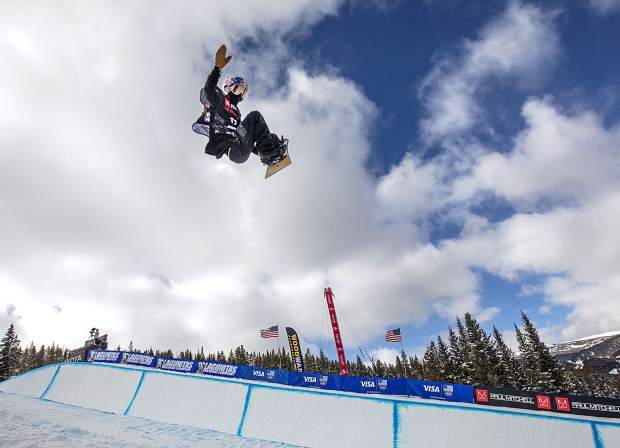 Devin Logan in the halfpipe finals of Toyota U.S. Grand Prix World Cup event Friday, Dec. 7, at Copper Mountain. 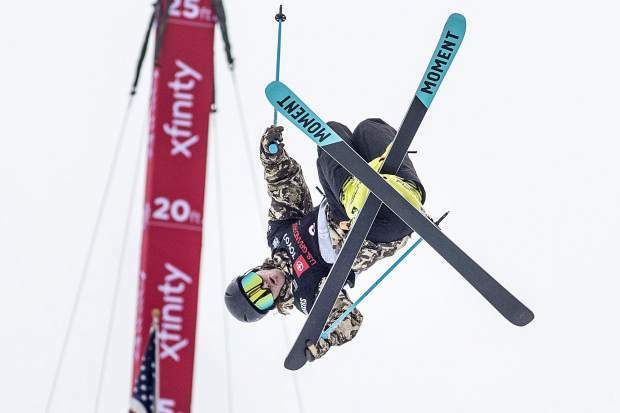 American freeskier and 2-time gold medalist in the winter olympics, David Wise, performs in midair during the qualifiers in the Toyota U.S. Grand Prix halfpipe competition Wednesday, Dec. 5, at Copper Mountain, CO.
Simon D'Artois, of Canada, crashes at the halfpipe during the qualifiers in the Toyota U.S. Grand Prix competition Wednesday, Dec. 5, at Copper Mountain. D'Artois qualified for the finals. 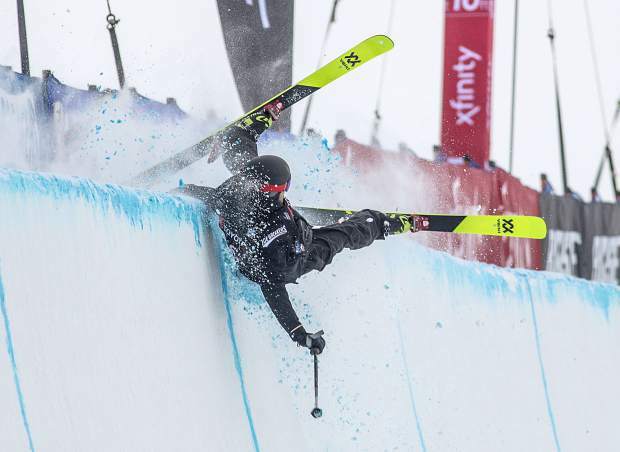 Freeskier Kevin Rolland, of France, crashes on the halfpipe wall during the qualifiers of the Toyota U.S. Grand Prix competition Wednesday, Dec. 5, at Copper Mountain. Rolland did not qualify for finals. 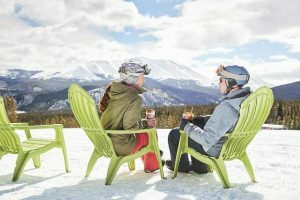 Breckenridge resident Arielle Gold executes a trick in the Toyota U.S. Grand Prix qualifiers Thursday, Dec. 6, at Copper Mountain. 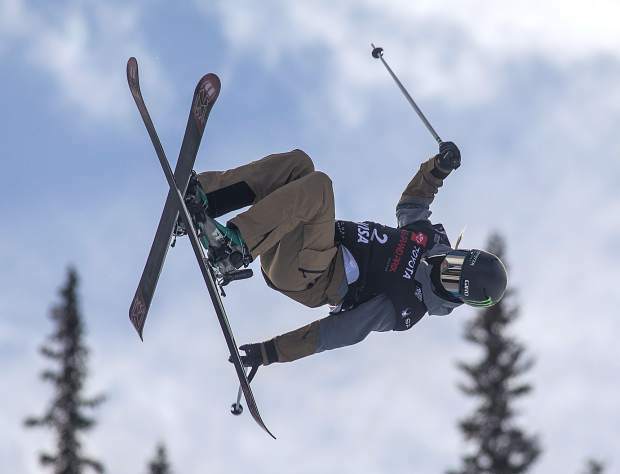 Jack Coyne in the Toyota U.S. Grand Prix qualifiers Thursday, Dec. 6, at Copper Mountain. 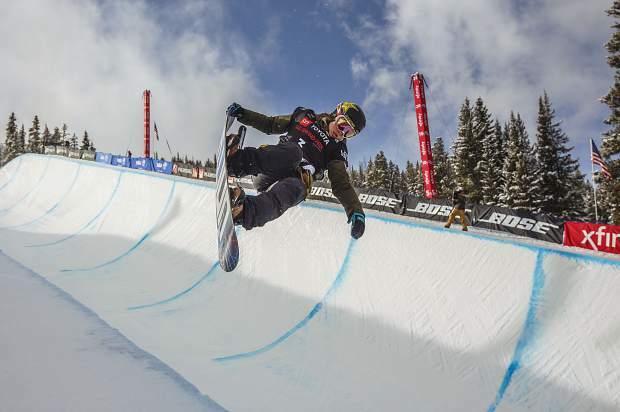 Halfpipe gold medalist, Chloe Kim, executes a trick in the Toyota U.S. Grand Prix qualifiers Thursday, Dec. 6, at Copper Mountain. Kim scored a high of 95.25 and qualified for finals on Saturday. 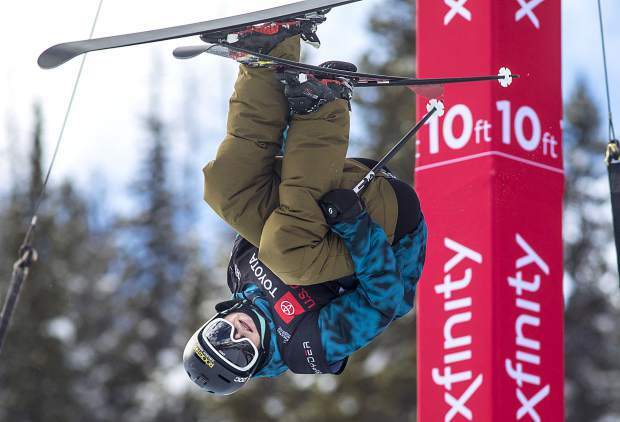 Aaron Blunck, of Crested Butte, executes a trick in the halfpipe finals of Toyota U.S. Grand Prix World Cup event Friday, Dec. 7, at Copper Mountain. 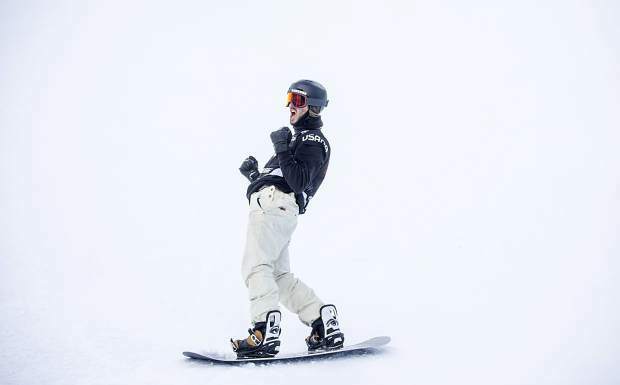 Blunck placed first with a high score of 96.25. 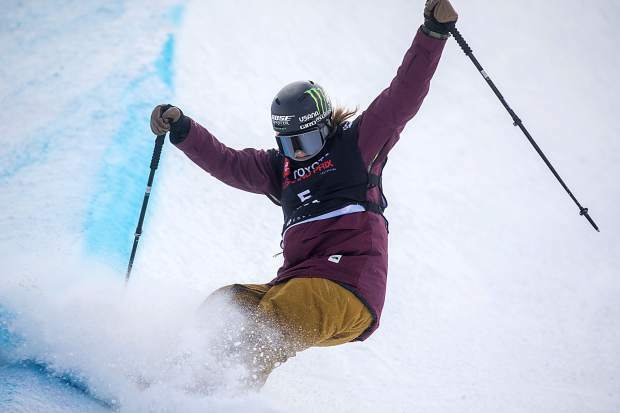 Nico Porteous, of New Zealand reacts following his the halfpipe finals of Toyota U.S. Grand Prix World Cup event Friday, Dec. 7, at Copper Mountain. 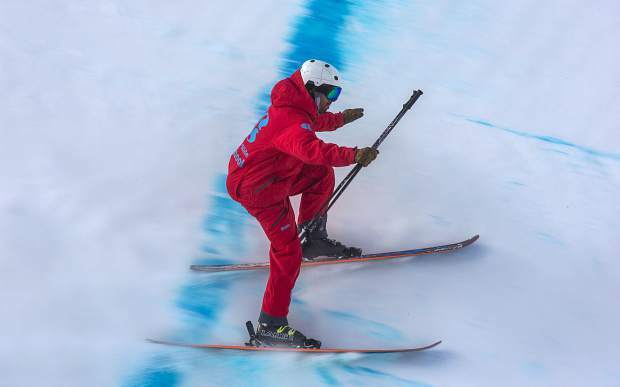 Nico Porteous placed 4th. 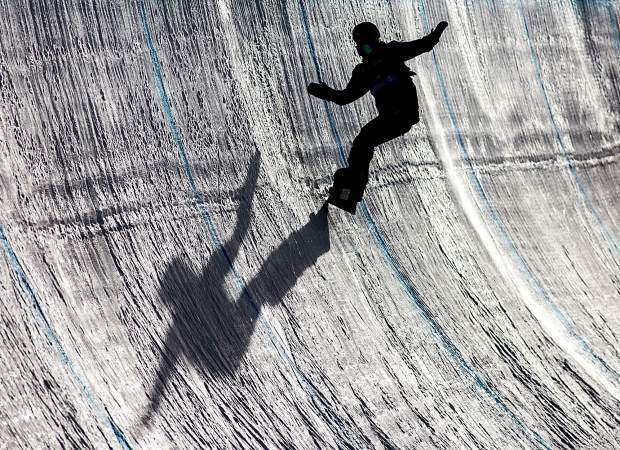 U.S. Olympian medalist Brita Sigourney, of California, executes a trick in the halfpipe finals of Toyota U.S. Grand Prix World Cup event Friday, Dec. 7, at Copper Mountain. 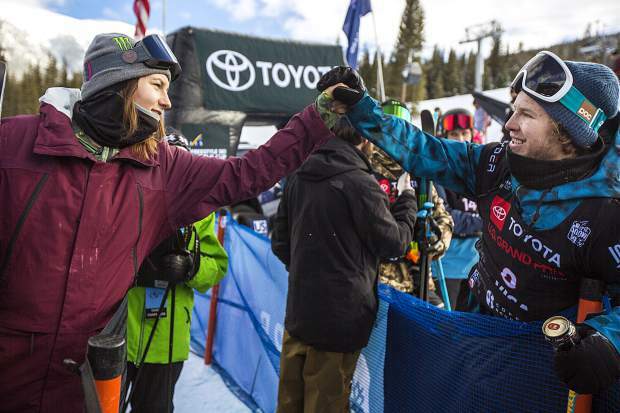 U.S. Olympian medalist Devin Logan, of Vermont, high fives Aaron Blunck, of Crested Butte, following the halfpipe finals of Toyota U.S. Grand Prix World Cup event Friday, Dec. 7, at Copper Mountain. Blunck placed first with a high score of 96.25. 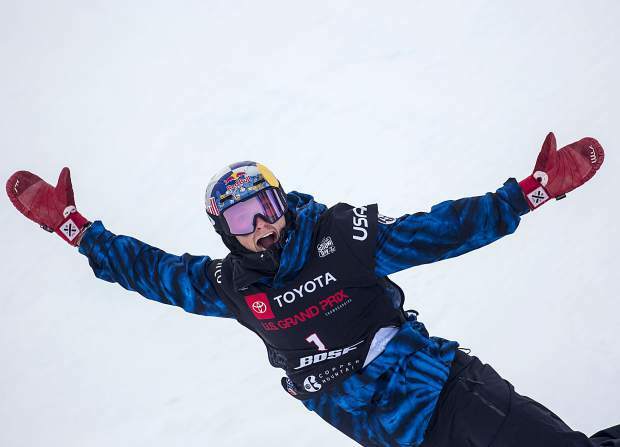 Scotty James, of Australia, reacts after getting the highest score of his last run in the Toyota U.S. Grand Prix World Cup halfpipe snowboard men's finals Saturday, Dec. 8, at Copper Mountain. James placed first with a high of 96.75. 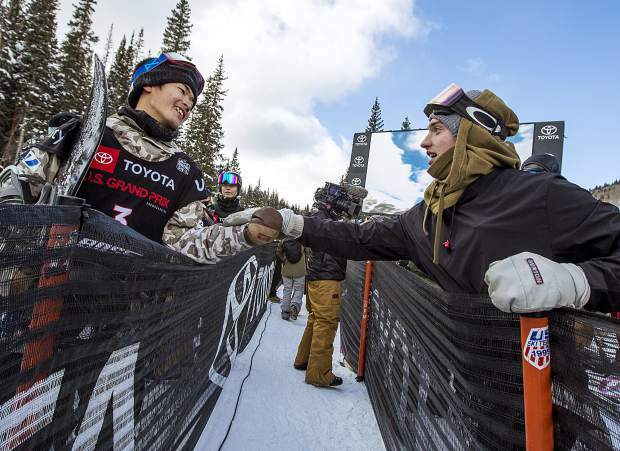 Eagle resident Jake Pates, right, greets Raibu Katayama, of Japan, at the Toyota U.S. Grand Prix World Cup halfpipe snowboard men's finals Saturday, Dec. 8, at Copper Mountain. 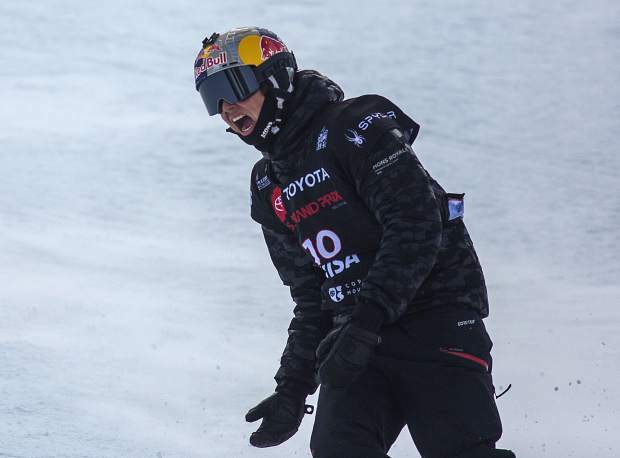 Eagle resident Jake Pates reacts after crashing in the last run of the Toyota U.S. Grand Prix World Cup halfpipe snowboard men's finals Saturday, Dec. 8, at Copper Mountain. 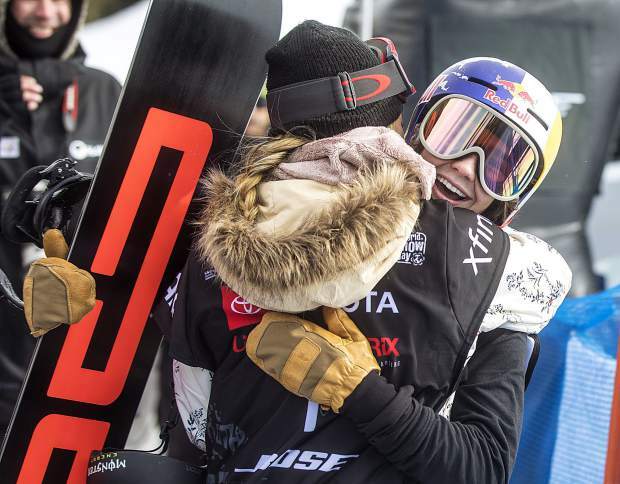 Toby Miller, of California, hugs teammate Chloe Kim following the Toyota U.S. Grand Prix World Cup halfpipe snowboard men's finals Saturday, Dec. 8, at Copper Mountain. 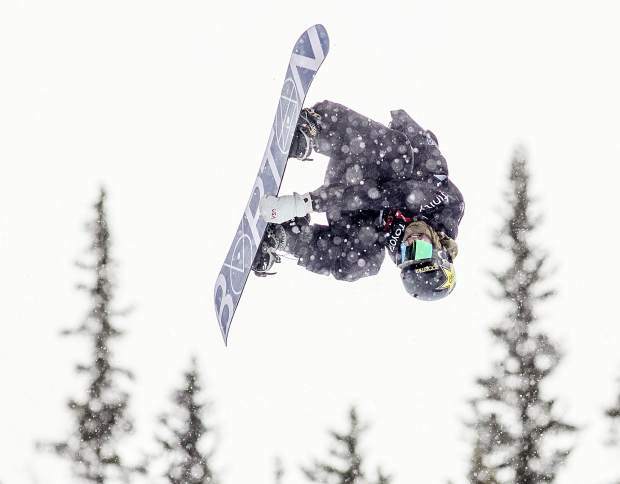 Toby Miller, of California, in midair at the Toyota U.S. Grand Prix World Cup halfpipe snowboard men's finals Saturday, Dec. 8, at Copper Mountain. 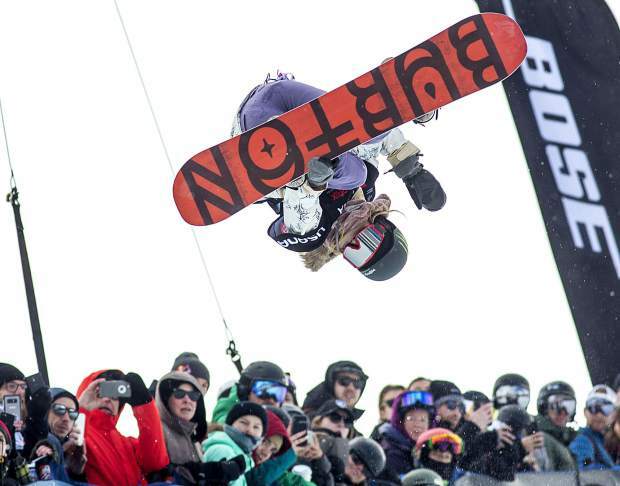 Maddie Mastro, of California, in midair of the Toyota U.S. Grand Prix World Cup halfpipe snowboard women's finals Saturday, Dec. 8, at Copper Mountain. 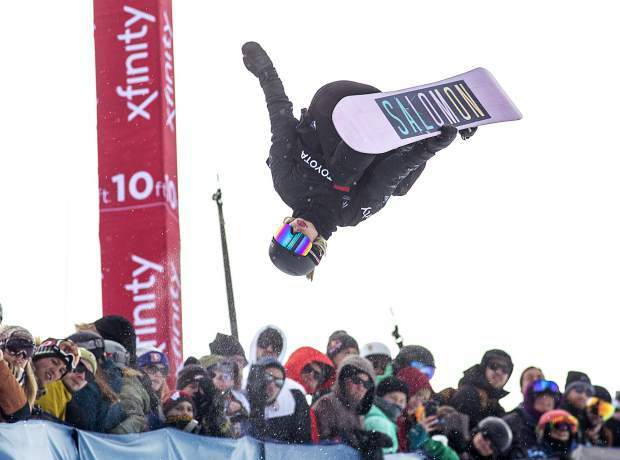 U.S. olympic gold medalist, Chloe Kim, wows the crowd in midair at the Toyota U.S. Grand Prix World Cup halfpipe snowboard women's finals Saturday, Dec. 8, at Copper Mountain. 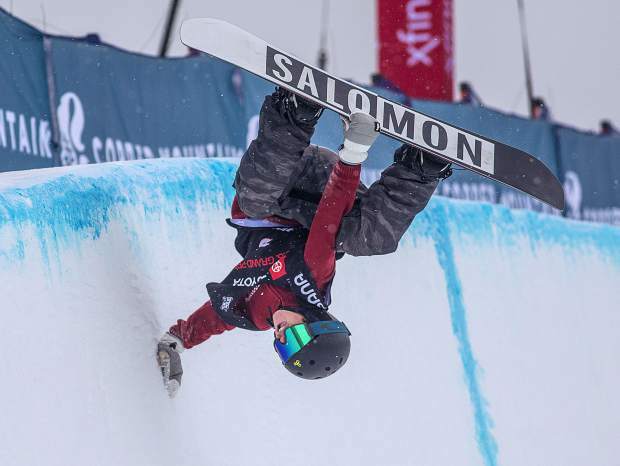 From the snowfall and sunshine to crashes and high scores, see the photo highlights from the Toyota U.S. Grand Prix World Cup halfpipe event at Copper Mountain.